Something very odd but extremely significant just happened in American politics, in practically the blink of an eye. The establishment media have gone from virtual 24/7 coverage of the narrative that President Trump colluded with Russia to crickets, and they did it overnight. My Take - Well, so much for all the so-called confidence Congress has in Jeff Sessions. His Senate buddies have come out in support, but one has to wonder just how broad that support is when the Lindsay Graham types are the most vocal in that support. That's like running for public office telling the world your a absolute conservative - and then have John McCain come out strongly in your favor. As a former Connecticut resident, I’m ashamed that my home state, which used to be a success story with no income tax, has now morphed into a high-tax welfare state that is now increasingly infamous for the outflow of productive people and taxable income. And even though I left several decades ago, I also feel vaguely guilty that my former state produces politicians such as Senator Chris Murphy. Most people have never heard of him since he’s never accomplished anything in Washington. Though I would argue that’s a good thing since he’s a knee-jerk statist. But I gather that Senator Murphy no longer wants to be in the shadows. Here’s a tweet he issued yesterday that has received a lot of publicity. 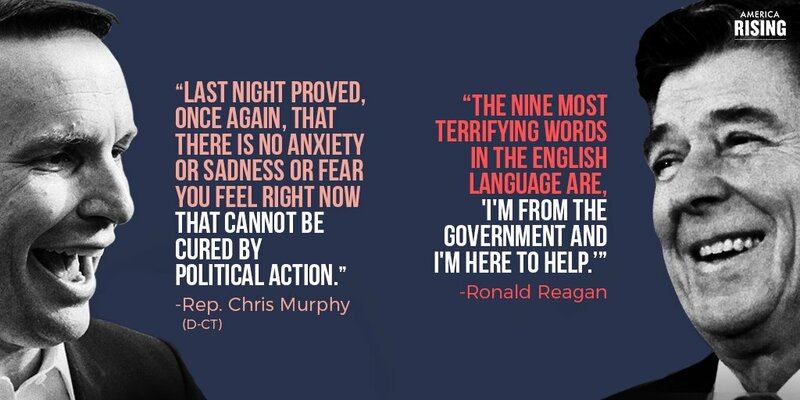 Chris Murphy@ChrisMurphyCT Last night proved, once again, that there is no anxiety or sadness or fear you feel right now that cannot be cured by political action. Wow, this is an astounding display of statolatry. The kind of statement one might expect from a functionary from a totalitarian regime. Are you afraid of spiders? Hey, government can help! Are there dandelions in your yard? Don’t worry, Big Brother to the rescue! Did McDonald’s forget to include a toy in your Happy Meal? Time for political action! While his views are reprehensible, I’m actually glad Senator Murphy inadvertently revealed his statism. If nothing else, it’s produced some clever humor. The folks at Twitchy have been sharing this tweet, which came from a parody account for a North Korean news service. By the way, if you’re like me and are not familiar with “Juche,” it’s apparently a North Korean twist on Marxism. In other words, take the traditional horror of communism and then add a layer of autarky to ensure even greater misery. And here’s another amusing take, juxtaposing Murphy’s statolatry with Reagan’s wisdom (see last video from this collection). And they even demoted him to Representative rather than Senator. But we shouldn’t merely mock Murphy. His views truly are reprehensible because they imply there is no element of human existence that is independent of government. The state is everything. And if that sounds familiar, it’s probably because you know something about economics, philosophy, and history. The most evil people in world history have expressed the same sentiment. 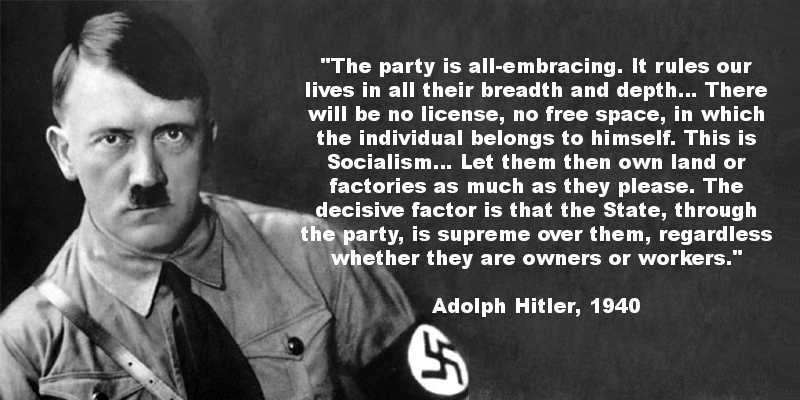 Such as the leader of Germany’s National Socialist Workers Party. And the first dictator of the Soviet Union. Though if I had to pick the quote that is closest to Murphy’s, it would be this awful statement from Mussolini. 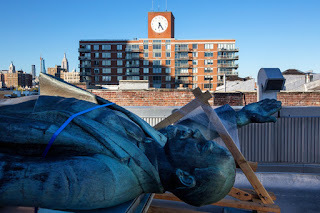 Senator Murphy obviously doesn’t share the horrid ideology of either national socialism or international socialism, so his version of statolatry is far more benign. Sort of like this cartoon instead of gulags and concentration camps. But I still think his views are reprehensible. We’re not children and the government is not our parents. America’s Founding Fathers strictly limited the powers of the federal government because they understood the risks of a coercive state dictating our lives. Even if it’s benign statism rather than totalitarian statism. After almost two years, the Environmental Protection Agency’s Office of Inspector General released its report on the Gold King Mine disaster that dumped over a million pounds of metals into the Animas River, turning dozens of miles of the river orange. While inspectors general are tasked with finding out the truth and holding agencies accountable, this recently released report sheds no more light on the disaster than previous misleading reports. EPA Administrator Scott Pruitt has inherited not only an environmental mess, but also the mess created by an agency more interested in its narrow self-interests than truth. Pruitt now has an opportunity to send a message that would ripple far beyond the EPA........There you have it: Experts “inadvertently … initiated an internal erosion failure.” It could have happened to anyone. Michael Mann has consistently refused to share his temperature proxy data for others to examine, forcing one to wonder what it is he has to hide. Do you remember “Mike’s nature trick” from the infamous “Climategate” emails? Penn State scientist Michael Mann grafted historical temperature data derived from tree rings and other sources to modern observations and smoothed things out to produce the now infamous “hockey stick” graph the UN likes so much. Mann’s graph and the approach he used to create it has come in for withering criticism from other researchers. Mann has consistently refused to share his data for others to examine, forcing one to wonder what it is he has to hide. (The Medieval Warm Period for one thing). Mann tried to use the courts to silence critics. EPA Administrator Scott Pruitt’s proposal to hold a TV debate on climate change science makes a lot of sense. This idea is very different from the Red Team exercise that he mentioned previously, which has seen a great deal of discussion, such as here and here. The Red Team exercise would be a highly technical scientific debate. In contrast a TV debate would be designed to, as Pruitt puts it, reach the American people. It could also be a great teaching tool. My Take - If Pruitt is wanting to have a public debate about global warming that would be understandable to the American public - I have the answer! They comment: "How to design such a debate raises some challenging issues. These include how many debaters should participate and who should they be, what the format should be, and at what education level should the scientific issues be discussed?" The below information is from Wikipedia here. Here to the right was a picture of the typical setting. Below are some U-Tube presentations. 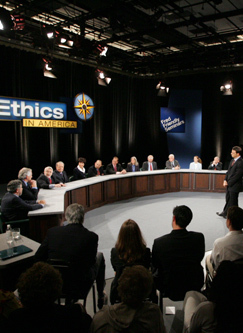 From 1988 and 1989 there was a ten part series of "Ethics in America" "developed and hosted by former CBS News president Fred Friendly and produced by Columbia University Seminars on Media and Society (later renamed Fred Friendly Seminars). It was funded in part by the Annenberg/CPB Project. "The original series included ten one-hour episodes:"
"Anatomy of a Hostile Takeover (Ethics in Business)"
"Do Unto Others (Personal Ethics)"
"Does Doctor Know Best? (Ethics in Medicine)"
"The Human Experiment (Ethics in Scientific Research)"
"The Politics of Privacy (Ethics in Journalism)"
"Public Trust, Private Interests (Ethics in Government)"
"To Defend a Killer (Ethics in Criminal Law)"
"Truth on Trial (Ethics in Civil Law)"
"Under Orders, Under Fire (Ethics in the Military, Part I)"
"Under Orders, Under Fire (Ethics in the Military, Part II)"
I can't imagine a better platform to expose the truth on this situation. One by one, the markers of Venezuela’s democracy have been pushed aside. First, the Supreme Court was packed with loyalists of the president, and several opposition lawmakers were blocked from taking their seats. Then, judges overturned laws that the president opposed, and elections for governors around the country were suddenly suspended. Next, the court ruled in favor of dissolving the legislature entirely, a move that provoked such an outcry in Venezuela and abroad that the decision was soon reversed. CARACAS, Venezuela (AP) -- President Nicolas Maduro is pledging to go after his political foes with the virtually unlimited powers of a constitutional assembly that his backers will select Sunday as his opponents wage a last-ditch battle to halt what they call the replacement of Venezuelan democracy with a single-party authoritarian system. 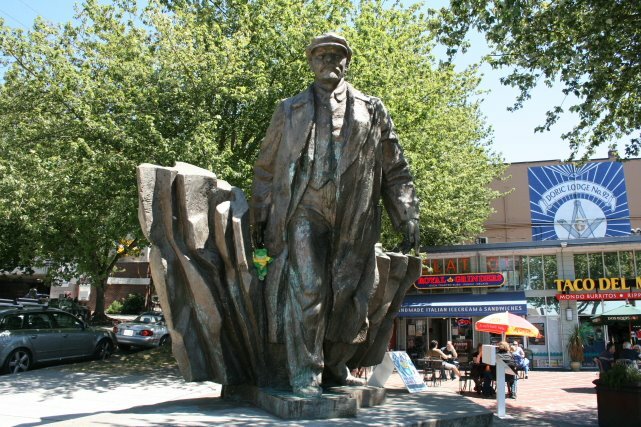 My Take - I love these western leftists who promote leftist thugs and tyrants and then are shocked when these thugs impose tyranny. Of course her view is this is not Hugo Chavez's fault! He would have never allowed things to get this bad if he was still alive. To believe that really takes a special kind of stupid. That's the facsinating thing about these loons, there's alway a loop hole in their condemnation. This woman, Bernie Sanders, Sean Penn and all the leftists who've benefitted so amazingly well from living in this American capitalist hell didn't permenantly move to Venezuela where their hero, Hugo Chavez, was in charge and creating another socialist paradise . Why? Because are all hypocrites and liars. So many of them are over educated and undersmart. They can't claim they didn't know this was going to happen because this is the history of leftism. And that history is incontestable. When it comes to healthcare reform, President Trump is no longer playing nice with the traitors in the U.S. Congress. Americans wholeheartedly want Obamacare repealed. The system, which has long been destined for failure, has raised the cost of healthcare in America to unacceptable levels in its short enforceable time as law. When Donald Trump promised to make repeal and replace Obamacare high on his priority list, We The People voted to put him in the White House. We made a statement: It’s time for Obamacare to go. My Take - Everyone is so confused by Trump and his actions and reactions - in some cases me too - and it's coming back to haunt him with the politicos and the media. But is it with the public? Not the public that voted for him, and the reason it isn't really coming back to haunt him with the public is he's saying the very things they're thinking. The talking heads smile and say the reason why this Republican "controlled" Congress can't get Obamacare fixed is because they never expected Donald Trump to become President of the United States - so they were unprepared. Unprepared? Even after eight years of voting to end Obamacare almost unanimously over and over again during Obama's terms they were "unprepared"? For what? How could they possibly have been unprepared? All they had to do is what they did for eight years - repeal it! What preparations were needed to do that? Grow a backbone? They do look like fools, but they also look like liars, hustlers, cowards and I think some of them will look unelected in 2018 and more in 2020. There is one more thing many of those who get re-elected will look like - the conservatives they've lyingly claimed to be for years. Here's the fact everyone seems to be missing. The media gloats over Trump's poll ratings, but his are twice as good as is the poll ratings of the Congress. So where are people laying the blame for all of this? At the feet of the Congress and specifically the leaders of both parties like Pelosi, McConnell, Ryan, Schumer and big mouths like McCain, Maxine. I really believe the 2018 election will be a blood bath on both sides. 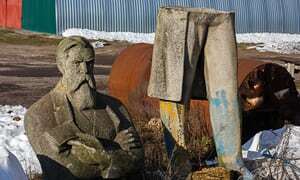 getting a statue of Friedrich Engels. When I give speeches about the economic case for small government, one of my main points is that people in the private sector (workers, investors, managers, entrepreneurs, etc) are motivated by self interest to allocate labor and capital efficiently. To be more specific, the pursuit of higher pay and greater profit will lead people to allocate resources productively. I freely admit that people in the private sector make mistakes (most new business ventures ultimately fail, for instance), but I explain that’s part of a dynamic process in a market economy. Every success and every mistake leads to feedback, both via the price system and also via profits and losses. All of which leads to continuous changes as people – especially entrepreneurs – seek to better serve the needs and wants of consumers, since that’s how they can increase their income and wealth. In other words, Adam Smith was right when he said that self interest encourages people to focus on making others better off. By contrast, when politicians and bureaucrats allocate resources (either directly via spending programs, or indirectly via regulation or tax distortions), feedback mechanisms are very weak. Once politicians intervene, they never seem to care if they are generating positive results. There are plenty of examples, however, of government imposing high costs while producing no benefits. Or even producing harm. Increased redistribution spending is associated with a halt in the historical progress against poverty. More education spending has completely failed to produce better education outcomes. More regulation and red tape to fight money laundering has not produced reductions in criminal activity. Foreign aid outlays that enable larger public sectors that undermine prosperity in developing nations. And let’s not forget that “Public Choice” teaches us that interest groups will manipulate government to obtain unearned benefits. The main lesson from all this information is that it’s good to have small government rather than large government. But there’s a secondary lesson about how the economic harm of government can be reduced if market forces somehow can be part of the process. 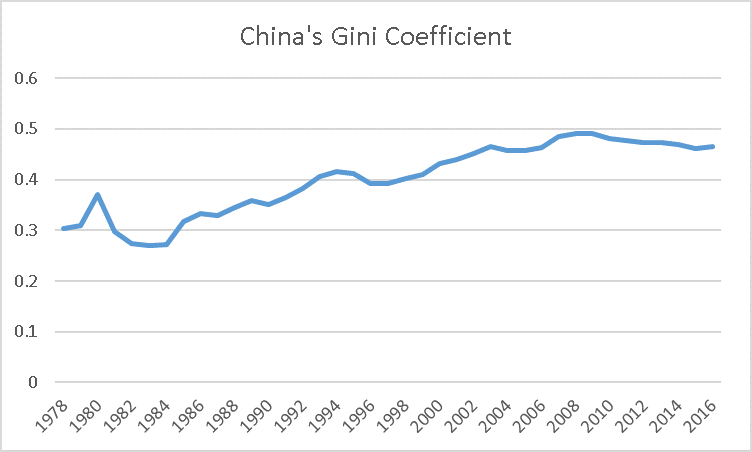 And that’s why a new study from two Italian economists at the Centre for Economic and International Studies is worth sharing. The abstract of the study is a good summary. We empirically investigate the effect of oversight on contract outcomes in public procurement. In particular, we stress a distinction between public and private oversight: the former is a set of bureaucratic checks enacted by contracting offices, while the latter is carried out by private insurance companies whose money is at stake through so-called surety bonding. We analyze the universe of U.S. federal contracts in the period 2005-2015 and exploit an exogenous variation in the threshold for both sources of oversight, estimating their causal effects on costs and execution time. We find that: (i) public oversight negatively affects outcomes, in particular for less competent buyers; (ii) private oversight has a positive effect on outcomes by affecting both the ex-ante screening of bidders – altering the pool of winning firms – and the ex-post behavior of contractors. In other words, normal bureaucratic waste, featherbedding, and cost overruns are less likely when the private sector does the oversight. And here’s an excerpt from the text for those who want more details. …we propose a distinction between public and private oversight, depending on its source. Public oversight includes all formal checks – cost certifications, pricing data transmission, production surveillance – which the contracting authorities enact during the contract awarding phase and execution. It typically involves considerable paperwork for both the buyer and the sellers. 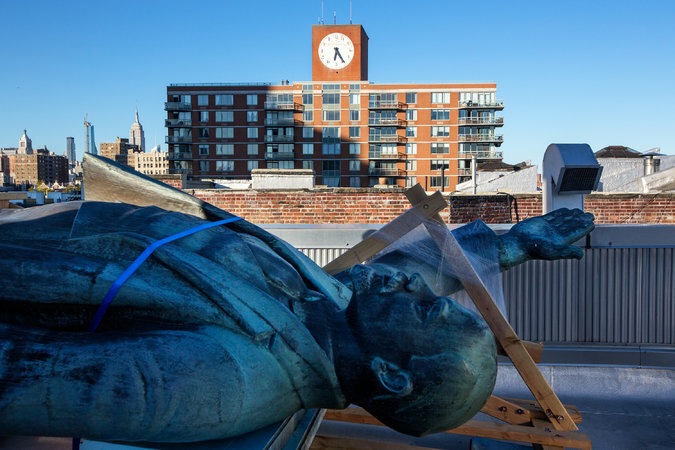 At the cost of some red tape, it is aimed at alleviating the moral hazard problem… On the other hand, private oversight involves third parties – surety companies – issuing bonds (surety bonds) to secure the buyer against unpredictable events. If the seller fails to fulfill contractual tasks, contracting authorities make claims to recover losses. A surety is then called on either to complete the public work by themselves (i.e. with their own resources or by subcontracting) or to refund the authority of the bond value. Being liable in case of unsatisfactory contract outcomes, the sureties have strong incentives both to screen bidders (ex ante) and to monitor contractors (ex post). They help mitigate the asymmetry of information between the buyer and the sellers thanks to their experience of the market – i.e. access to private information – and the screening enacted through price discrimination on premia, which directly affects offers placed by potential contractors. Hence, private oversight enhances the selection of the best contractors and provides a second tier of monitoring of contractors’ progresses. This is encouraging. It would be nice to have smaller government, but it also would be nice to get the most bang for the buck when the government does spend money. To be sure, there are probably many parts of government that are impervious to market forces. But surely there are many ways to protect taxpayers by creating incentives to save money. For instance, on the programmatic level, we can enlist the private sector to fight rampant Medicare and Medicaid fraud by allowing private investigators to keep a slice of any recovered funds. And on the sectoral level, we can achieve big educational gains with school choice, thus giving schools a bottom-line incentive to attract students with better outcomes. Last but not least, we can rely on the competitive impact of federalism to encourage better macroeconomic policy by state and local governments. The moral of the story, needless to say, is that the private sector does a better job than government. So let’s do what we can to unleash market forces. Be more like Hong Kong and less like Venezuela. Maxine Waters was more interested in grandstanding on Thursday than actually getting answers to her questions. While the California congresswoman was able to ask Treasury Secretary Steve Mnuchin questions during a Financial Services Committee hearing today, she repeatedly reclaimed her time, preventing him from providing answers. Waters began sparring with Mnuchin after he had a question about the hearing rules. “Mr. Chairman, I thought when you read the rules, you acknowledged I shouldn’t be interrupted and that I would have—,” Mnuchin said to committee chairman Jeb Hensarling.“Reclaiming my time,” Waters interjected. “What he failed to tell you was, when you are on my time, I can reclaim it.”...........“Reclaiming my time. Reclaiming my time. Reclaiming my time. Reclaiming my time. Reclaiming my time,” Waters said over Mnuchin. My Take - Maxine Waters - The gift that keeps on giving. A naturopath is not a physician, should not be able to substitute for one, act like one or even play one on TV. However, in the last few weeks, the Massachusetts legislature passed bill 2335 "An Act establishing a board of registration in naturopathy," that will give the profession of naturopaths legitimacy - one of the worst moves that they could have made for the health of the people of the "bay state." The heart of the bill designates that a board will be instituted to determine the role of naturopaths and define their abilities and limits. The five person board will be made up of two naturopaths, one physician who works with naturopaths, one pharmacologist and a member of the public - which is absolutely ridiculous. That is like a board on the regulation of cigarettes being made up two smokers, one person who sells cigarettes, one person who studies the effects of nicotine, and a random person from off the street. Football is not the same game it was 10 years ago. Evidence over the last decade has been mounting that parts of the game are harmful to some of its players. Specifically, those who experience repeated concussions or head trauma, resulting in a type of irreversible and degenerative brain damage called chronic traumatic encephalopathy (CTE). A new report published in the Journal of the American Medical Association (JAMA), entitled Clinicopathological Evaluation of Chronic Traumatic Encephalopathy in Players of American Football brought this issue into the spotlight this week, largely because of its splashy results..........What the study suggests is that some football players will end up with brain damage. However, the percentage of how many is still up in the air - way up in the air. I don't want to deflate this important work (I'm not Tom Brady, after all), but, any further numbers or details are yet to be determined. But my favorite video, which I shared back in January, is his concise explanation of why policy makers should focus on fighting poverty rather than reducing inequality. I’m posting it again to set the stage for a discussion on inequality and fairness. The answer is obvious. Or should be obvious, at least to everyone who wants to help the poor more than they want to punish the rich (and there are plenty in the latter camp, as Margaret Thatcher explained). And Senators Think Trump is Crazy? Klayman: Mueller Must Be Fired Now! Britons never shall be slaves? Over $1.4 Million in Student Loan Debt… For What?